“Bloom. A theme God has placed on my heart for over a year now; a word He has whispered to me, over and over, revealing His truth in its many different meanings. Thrive. Flourish. Open. To produce or yield fruit. Bloom. 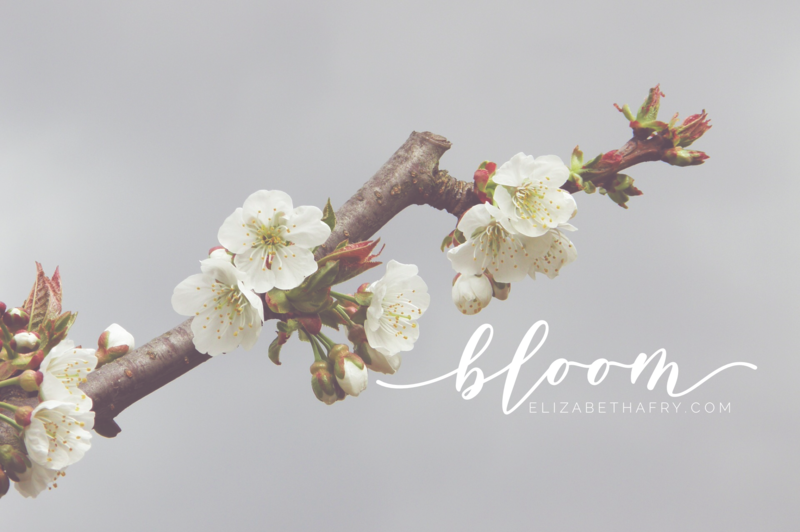 To bloom or bear fruit is a theme threaded throughout the Scriptures. Jesus himself uses it as a powerful, yet gentle invitation; a call to action. “I am the true vine, and my Father is the gardener. He cuts off every branch in me that bears no fruit, while every branch that does bear fruit he prunes so that it will be even more fruitful. Remain in me as I also remain in you. No branch can bear fruit by itself; it must remain in the vine. Neither can you bear fruit unless you remain in me” (John 15:1-2, 4, NIV). Upon reading these words in the midst of a season of change, I felt convicted. A deep desire began to awaken within my soul. What could this kind of transformation look like in my own life? What kind of fruit could I bear if I truly surrendered my life, my plans, and my daily desires to God and allowed my soul to bloom? Over the past year, in my new role as a work-at-home mom, I didn’t feel much like I was thriving or flourishing. Balancing the daily demands of caring for three young children at home with my corporate job, left me little time for myself. Most days ended in exhaustion, frazzled nerves, and battered emotions. I was wilting rather than blooming. Losing patience, growing frustrated, and feeling like a failure were regular occurrences. It is all too easy for me to focus on the negatives and walk down an unhealthy path of introspection. Consistently putting pressure on myself to do better, be more, and strive harder each and every day to create a perfect life that pleases God. This misplaced quest for perfection can too easily become an obsession as if somehow controlling and correcting my circumstances will yield the perfect me. Against that kind of standard, I can never measure up. I am left feeling dejected and depressed; lacking confidence in my role as wife, mom, friend, and follower of Jesus. Yet I know that striving for perfection is not what pleases God. I know that I am already deeply loved and accepted for who I am, through the redemptive blood of Jesus Christ, being made holy each day through His grace and love. I can, therefore, grow and learn and surrender every moment to the One who holds my very breath in His hands, knowing that He already loves me and always will. “I am the vine; you are the branches. If you remain in me and I in you, you will bear much fruit; apart from me you can do nothing. As the Father has loved me, so have I loved you. Now remain in my love” (John 15:5, 9, NIV). A flower will bloom for a time and then slowly wilt, fade, and die. A fruit-bearing tree, such as an apple tree, begins as a seed and then burrows its roots deep underground. The process is painstakingly slow. Each of the four seasons come and go and that little seedling eventually makes its way above ground and begins to sprout. After three to four years, it will produce limb, leaf, and root growth and around the fifth year, an apple tree will finally blossom in the spring, grow during the summer, then produce a harvest of fruit in the fall. In the winter, it will rest in order to prepare for the coming year.